Trips and expeditions to Aconcagua, the summit of South America: Polish traverse Route. The seven summits, the highest peaks of the 7 continents! Trips, Statistics & information! Below is the information about our Polish traverse route program; Check here for the prices and dates. Aconcagua can be climbed without any technical experience, but should not be underestimated. General mountaineering experience is certainly needed to avoid injury or death, even on the "Normal route". 7summits.com offer fully serviced and guided trip up the 2 most used routes as well as an additional couple of days to acclimatize even better (EAP, or Extra Acclimatization Program, available for both routes). On our Polish Traverse route you will ascend slowly on a less crowded and more scenic route. This route follows the approach of the technical Polish Glacier route but traverses to the normal route! This means you will be able to enjoy the more wild and remote Vacas valley (less than 15% of the climbers use this route, 85% use the normal route! ), without needing ropes and ice axes etc. This route is recommended for it's beauty and versatility. It is a bit harder as the terrain is rougher and no porters for common gear (tents, food) are included, but recommended over the Normal route. As the program is also a few days longer, chances for summit success will be higher if you are strong and well trained (fit). NEW: due to popular demand we now descend the Normal Route. This way you see the entire mountain and will have a shorter descent/trip! Leñas Camp. The equipment will be carried by mules. At arrival, you will set up tents and you will be able to rest. Normal Route. Here, Camp 3 will be installed, strategically located for its altitude and protected from strong winds. experience, and then return to Camp 3. That night, you will rest with the satisfaction of having reached your aim. OTHER UNFORESEEN EVENTS. PLEASE BE FLEXIBLE IF NECESSARY. Technical difficulty: This route does not present any technical difficulty. Even though in this expedition you take some part of the Polish Glacier, you do not require a previous climbing experience on rocks or ice. Physical difficulty: Like in the Normal or Northeast route, the process of acclimatization is really important in order to succeed in reaching the summit. As this is a very important factor on any of our expeditions, the only previous requirement would be to follow a program of training adapted to the activity that you are going to do. The rest of the program is planned in order to make you enjoy and get to know one of the most beautiful traverse in the Aconcagua Mountain. Other types of difficulties: The biggest problem that you have to face on your expedition is the effects of the altitude on your body. These can be overcome with a previous and correct acclimatization, which is covered in any of our programs. Another difficulty is the low temperatures on the mountain, the effects of which are reduced with a high-quality clothing and equipment. We’ll be waiting for you at the airport to drive you to the hotel, allowing you to enjoy your trip fully. You will stay in a comfortable hotel for two nights, both when arriving in Mendoza and when returning from the mountain. The rooms included in our program are double (each passenger will have to share his / her room with one of his / her expedition partners) and breakfast and taxes are included in the price. If you prefer a single room (only for you), please do not forget to let us know in your Booking Form. This service has an extra cost. Mount Aconcagua is located in a provincial Park, managed by the Government of Mendoza. To get into the Park, you should get a permit, the price of which will depend on the activity that you are going to participate in (climbing, long trek, short trek). This working paper must be done personally, as a government rule. That is why each passenger should go to the Park’s office with his or her own passport. The guide will assist you with the payment of the permit, and with the working paper. We will pick you up from your hotel and take you to Puente Del Inca in our own vehicles. We will drive over 180 kilometers, which separate Mendoza City from Puente Del Inca. The scenery throughout this journey is boasted as one of the most spectacular landscapes in the Central Andes. Throughout the expedition you will enjoy all meals (B: breakfast / L: lunch / PL: packed-lunch if you are on the move / D: dinner), carefully planned by professionals to have a balanced diet during those days in the mountain. During the expedition our cooks prepare every meal, with fixed menu from day three, except at the high altitude camps where our guides will be in charge of the cooking. Those meals mentioned in the itinerary are included. If you are vegetarian or celiac, or if you need a special diet, please let us know in your Booking Form. It will be a pleasure for us to prepare a special menu for you. This service has an extra cost. Puente Del Inca hotel was built here and it is the only lodging in this strategic zone, five kilometers far from the Aconcagua Park trailhead. You will spend one night in this place, at the beginning of your expedition, in rooms for three to six people (according to the number of members in the group) and with a private toilet. Complete breakfasts and dinners in the restaurant of the hostel are also included. Our mountain guides will advise you on what to include in your luggage and the way in which it should be arranged on the mules. We own more than 100 mules which carry people or belongings. The difference between the mules that carry people and the mules that carry gear is that the ones for people are tamer. These animals pasture during autumn, winter and spring, this means, from the middle of March to the middle of November. Before starting with the summer season, these animals are tested and given medicine by veterinarians. They are treated with caution. days, so as to recover from this activity. The negative aspect of these animals is their untamed character. That is why we have selected a professional team of muleteers, called “Arrieros”, who have dedicated their lives to the country animals”. Experience has taught them how to deal with these animals. From Puente Del Inca to the intermediate camps, Pampa de Leñas and Casa de Piedra, from here to Plaza Argentina and in the return from Plaza de Mulas to Puente del Inca, your belongings will be carried by mules. Each mule can carry up to a limit of 180 kg, but our mules only carry 60 kg to move comfortably on the mountain. Every client may transport on the mules a maximum of 30 kg on each stage of the approach. We strongly recommend you to bring a strong duffel bag. You will be driven in our own vehicles for 16 kilometers, from our hostel in Puente del Inca to Quebrada de Vacas, in order to start with the trek. While you are gaining height, your body needs some time to start with the acclimatization process. Therefore, it is extremely important to stop for a night in Pampa de Leñas and the following day continue with the trek to Casa de Piedra. In every stop you will meet the Arrieros, who will give you your gear to spend the night. The guides will help you to set up the tents, and will prepare the dinner and breakfast. Once you have arrived at Plaza Argentina, you will spend some nights in our own campsite, fullyprepared to make the trip around the magnificent South American Mountain, as comfortable as possible. With tents for eating, another for the kitchen, a third tent for equipment storage, and toilets. Here you will spend 4 nights. Excellent workers, who will prepare delicious meals and provide an excellent service, will attend you. When you return from Camp 3 Piedras Blancas, you will spend a night at Plaza de Mulas Base Camp, fully prepared as well as Plaza Argentina. You will also find here tents for eating, another for the kitchen, a third tent for equipment storage, and toilets, and you will be attended by excellent workers. On the Aconcagua Mountain, “the porters” have gradually become more important. Their maincharacteristic is that they are very strong people, they have been on the summit several times and this gives them a better athletic condition than athletes themselves. We believe that their job (which is carrying the ordinary equipment of expedition: altitude food, tents, stoves, fuel, and the garbage produced by the group),helps our participants to move in a comfortable way and with more energy to achieve their goal, which is getting to the summit. Therefore, these people are going with you, to help you. A porter is capable of carrying up to 20 kilos in each trip; this is equivalent to the gear of three passengers. The porters will help you to carry these things from Plaza Argentina Base Camp to Camp 1, from here to Camp 2 and then to Camp 3 “Piedras Blancas”, and finally in your return, from camp 3 to Plaza de Mulas. Each client has to carry his own personal equipment (backpacks), but if you wish to hire a porter, let us know. This service has an extra cost. Our mountain guides are qualified professionals of the AAGM (Argentinean Association of Mountain Guides) and the EPGAMT (School of High Mountain and Trekking Guides). The last qualification is the result of 3 years of study. We believe that to succeed in our expeditions, professionals with experience and the ability to offer security should guide our teams. The expeditions are led by a mountain guide to every 3 clients. Their equipment includes: VHF radio, a firstaid kit, complete with the appropriate drugs for altitude sickness, ropes, an altimeter, and professional clothing and equipment. All these will provide security and comfort. Our expeditions include two extra days in case of contingencies that may prevent the normal development of the itinerary. Sometimes conditions are out of our control, and our guides reserve the right to modify the schedule in response to the circumstances and safety of the group. If this situation arises, the client will not receive any sort of severance payment. You will see that we keep track of where we are at specific sites along the way. We take advantage of the VHF and BLU radio lines that help us maintain contact between the highaltitude campsites, Plaza Argentina, Plaza de Mulas, Puente del Inca and Mendoza. Therefore, we can respond almost instantaneously, to whatever issue that may arise. 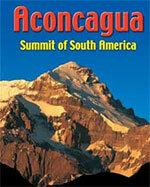 Normally, during the summer high season, Aconcagua is a mountain with good weather conditions. Yet, if you happen to have a few stormy days, you will be responsive to nature’s whims at high altitudes. Therefore, we will be sure to provide you with the highest quality tents at these high altitude campsites. We use only two brands: The North Face and Mountain Hardwear, which have proved to work well for our clients over the years. three climbers may sleep in one tent. Remember that you will have to set up your own tent with your partner. The guide will help you when necessary. Once your expedition is over you will receive a summit certificate and an Aconcagua t-shirt from our company as a gift. It is essential to acquire a climbing permit to enter the Aconcagua Provincial Park. The price varies according to the season in which you enter the Park (low, mid or high). Please contact our staff to learn the current value according to the starting date of your expedition. This procedure is personal and the payment must be done in Argentinean Pesos directly to the authorities of the Aconcagua Provincial Park, in Mendoza. Our guides will accompany you and will advise you on the process of purchasing the permit, on the morning of day 2 of the itinerary. The amount of the permit is non-refundable and the price may suffer increases without prior notice by the authorities of the Aconcagua Provincial Park. The payment of the fee contributes to the maintenance of the Aconcagua Provincial Park (collaborating with its protection and preservation) as well as with the maintenance of the Medical Services and Rangers. The permit entry to Aconcagua Provincial Park is not included in this program. In order to have better but cheaper services, the expedition is quoted taking into account the whole group. In any case that you give up the scheduled itinerary because of personal problems, mountain sickness, etc., you start taking private and individual services. The extra expenses that you will pay for, if necessary, are: mules from Plaza Argentina to Puente del Inca (around U$D 360.-), the private transfer from Puente del Inca to Mendoza city, etc. Once you give up the itinerary, the transfer in a regular bus is included. The night in Mendoza hotel when you return can be taken as soon as you get the city. There is a possibility that you be evacuated by helicopter, and in that case your belongings will not travel with you. If you do not wait for your belongings in Puente del Inca, in this case you have to pay not only for the mule to carry your equipment down, but also a transportation to take your belongings to Mendoza. Each person is responsible for his belongings and personal equipment. Neither the technical nor the mountain equipment is included services, so you would have to buy them or rent them. Take into account our guides if you need assistance. If you rent equipment, you will be responsible for it. Apart from that, you must give the equipment back to the mountain shop in time. The porters to carry the personal equipment are not included. They may help you to transport your belongings from one camp to another, thus offering you a better result on the mountain. So do not hesitate in letting us know, if you decide to hire one. The price will depend on the stretch your equipment will be carried. The transfer from the hotel to the airport at the end of the expedition is notincluded. If your luggage is lost during your flight, or it arrives later than you do in other flight, you will have to work the problem out with the corresponding air line. carried out as initially planned, and you will be responsible for those extra expenses caused by this shortcoming. Note that the standard programs might be too fast for some people. If you acclimatise slowly, then you can book the Extra Acclimatisation Program, in which you start 2 days before the main group (basically a private trip). This gives you extra time to acclimatise in Basecamp (2 extra nights including a training ascent), where the rest meets you. Anyone who wishes to participate in the climb with their own groups or cannot join in the scheduled expeditions can take a private expedition. The itinerary to develop is the same as in the scheduled expedition, but with changes in the included services and in the date of departure, which can be chosen by the passenger. Prices depend on exact itinerary, trip length and number of people in you group; see the example prices on the trips page or email us. To make a reservation, 7summits.com Expeditions’ booking procedure consists in two parts: in the first one you have to fill in the bookingform you will find in our website, which has to be sent back by fax or as an email attachment (PDF, or scan/jpg, signature is important). You will then receive the 2nd part by email, which is a Word document with detailed questions about your health, experience, flight details etc. You can email teh document back (no need for fax, so we can make changes to your flight details etc on file if needed). Only once we receive the advance or full payment your space is confirmed. If you wish to have your personal gear portered, you can reserve a porter, please let us know when booking.